I joined the e-commerce/social shopping platform in 2013. During my 8 months there, I redesigned the Sellers dashboard and the user checkout flow to support the requirements of the new growth strategy. I redesigned the marketing site and the marketplace to make them responsive, and created Storenvy’s first marketplace app for iOS. The dashboard allows sellers to manage their store, inventory and orders. 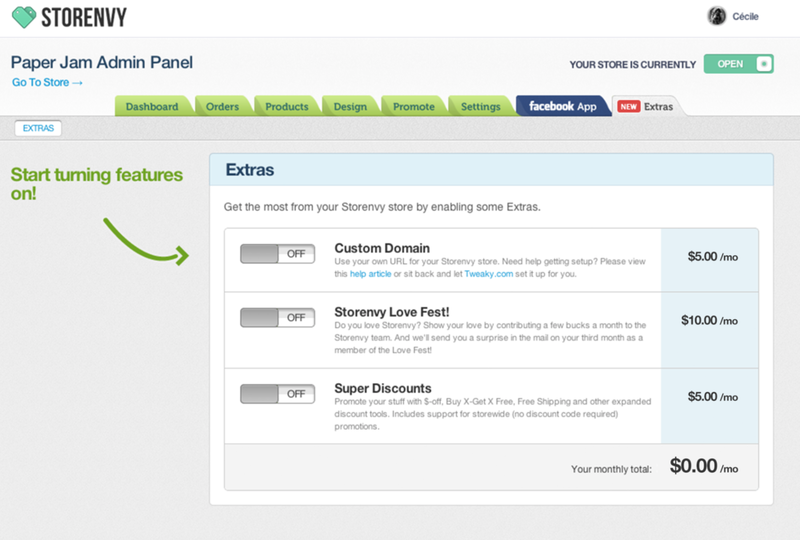 When I joined Storenvy, the appearance of the dashboard provided insights into the history of the startup. You could tell features had been rapidly added, with little regard for the architecture or the user experience. Modules that were intrinsically related lived on different pages, and UI patterns were inconsistent throughout. The team was eager to start fresh. I was tasked with redesigning the dashboard to improve usability and bring a nicer and more consistent UI library. I kickstarted the project with an audit of the existing platform: mapping features, design patterns... I scheduled and led interviews with a dozen of Storenvy sellers, watched them use the product and asked them to describe their flows. Followed several brainstorming sessions with stakeholders, whiteboarding with color-coded sticky notes, and hundreds of wireframes and visual iterations. After creating an account via Facebook, shoppers are introduced to a selection of Storenvy's most popular stores. They are asked to follow at least 5 of them, to ensure their feed displays relevant content from the start. Storenvy's unique approach to e-commerce is best represented by its social feed. Every time a store you follow publishes a new product, makes an announcement, or offers a promotion, the news appear in your feed. Your feed also indicates whenever shoppers you befriended "envy" or collect a product, write a comment, or make a purchase (unless they opted for private shopping).